What is a niche? For Samsung, it’s about inventing a new product category and then heavily marketing it so consumers will buy whatever that is. It seems to work; Samsung was successful with the last few phones in its first product niche, the phablet-sized Galaxy Note series. The Galaxy Note Edge represents it's latest niche: phones with a sharply curved display edge. 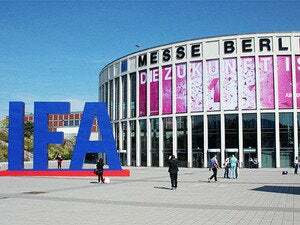 I went hands-on with both the Galaxy Note 4 and Galaxy Note Edge at IFA in Berlin, where both devices were just announced. They each exist to serve a particular purpose, and while the Galaxy Note 4 seems like a worthy product, I'm still scratching my head about the utility of the Note Edge. In my 20 minutes of woman-handling the Galaxy Note 4 I can already say that I feel more optimistic about it than I did about its predecessor. The Galaxy Note 4 looks and feels better than any other Galaxy Note device I’ve held. Its matte-and-faux-metal trim on the edges are a seriously nice touch and I like how pearly white the rest of the chassis is. Its backside still sports that faux-leather outfitting, but if you’re sick of that you could always break the bank to get the Swarovski version, which is fabulously gaudy. This is seriously the best way to bejewel a phablet. As for the rest of the phone, you’re seeing the same great Super AMOLED technology Samsung used with the Galaxy S5 packed into a Quad HD, 2560x1440 resolution display. I maintain that Samsung’s smartphone displays are still too saturated for my liking. The company also swears that the display’s increase in pixels won’t affect its 3,220mAh battery pack, but I’m skeptical about that, too. I’ll be looking forward to seeing how it performs in an official battery test. 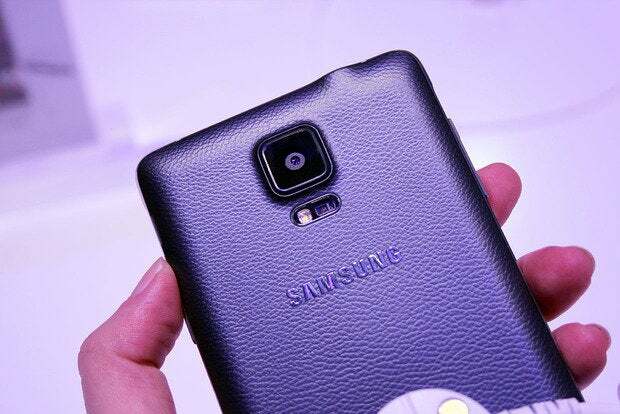 The backside of the Galaxy Note 4. Samsung also touted its new voice recording capabilities and its ability to recognize different voices at once. As a journalist, I definitely appreciate that capability, but I’m more concerned about that rear-facing speaker. It’s still just one measly little speaker that’s putting out all of the Galaxy Note 4’s sound, and it still sounds strained. Why won’t Samsung convert to front-facing speakers? 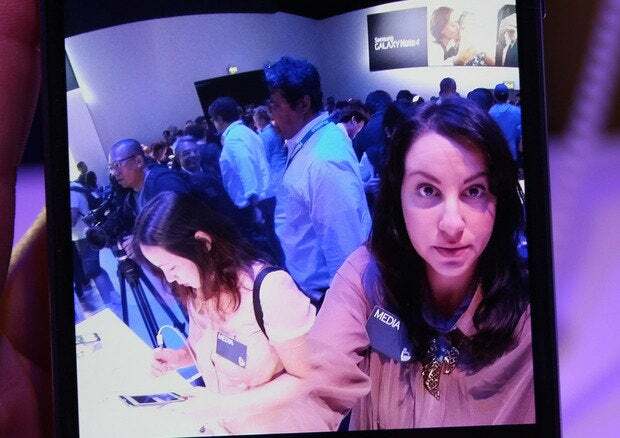 Of course, I can’t write about the Galaxy Note 4 without writing about its wide-angle selfie mode. Unfortunately, it uses Samsung’s panoramic abilities to take the photo, which resulted in a messy-looking selfie (seen above). Can you imagine asking your friends to hold still while you pan from left to right to take the photo? Samsung kept Air View, which you can bring up by "clicking" the S Pen. My penmenship never did transfer very well to the screen via Samsung’s S Pen, but this new version is huge improvement. The pen offers textured feedback, making it easier for those of us who normally write messily and press hard on a piece of paper to actually write on the Note 4’s screen. I didn’t feel like the stylus was slipping and sliding from edge to edge. I'm writing stuff! And it's so much easier with this fourth-generation S Pen. In its presentation, Samsung said that Mutli Window users had complained that the feature was hard to find and get working. I don’t think the new version is easier to use than previous versions, but I attribute that partly to the fact that I’m still not entirely used to using a stylus on a smartphone. I’ve been using my fingers to do things for years and I’ve never had a Galaxy Note as a daily driver. And for the most part, if you’re not using the stylus to do things like Multi Window, you might get frustrated at how tedious it is to move windows and apps around. Or maybe I’m just afraid of change. A demo of the Note 4's Smart note feature, which actually works quite well. Yes, it's curved only on one side. Imagine this: Samsung stopped production on he Galaxy Note 4 and swapped out the regular flat screens with curved Super AMOLEDs. 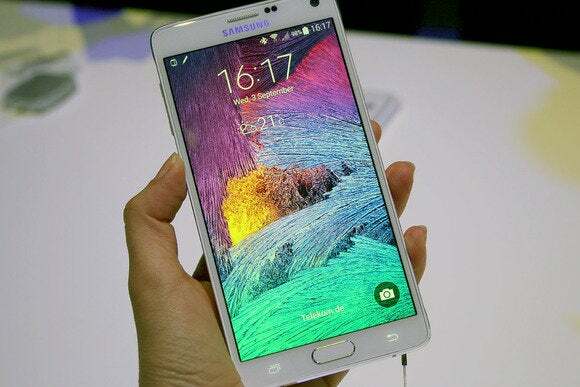 It’s called the Galaxy Note Edge, and it features a display that drops off steeply on the right-hand side. This particular area of the screen acts like a scrolling ticker of sorts—as if you didn’t already feel bombarded by information on a constant basis. Oh. Cool. It's that sidebar feature that I usually disable on TouchWiz anyway. Except now it's permanently there because of how the screen is curved. I didn’t have a chance to see what other apps look like on the curved portion of the phone, but I wasn’t particularly impressed with the ticker’s different abilities. I think Samsung jumped the gun on this product, just so it could say it was first. It risks another company taking the curved screen idea and making it better, however, thus making a mockery of this device. We’ll have more on either phones later this fall when when we get a chance to spend more time with the devices and suss out how they perform in the real world.